The BIOSTAT® RM (Rocking Motion), is a fully GMP compliant, wave-mixed bioreactor. It is used with single-use Flexsafe® RM bags which are proven for a broad range of different cell lines incl. CHO, NS0, SF9, E.coli, stem cells and CAR-T cells. Depending on your individual process needs and working volumes you can choose from a variety of system and bag configurations. Regenerative Medicine therapeutics repair, replace and engineer human cells, tissues and organs to restore their normal function. The discipline has great potential to address clinical needs that are currently unmet by conventional pharma or biopharmaceutical products. Rocking motion bioreactors are widely used for the expansion step during stem and T-cell cultivation processes, incl. CAR-T. Companies are actively approaching us to work on the integration of our rocking motion bioreactors into their process environment and explore the PAT capabilities coming with our single-use systems. Tests that these customers perform with Flexsafe® RM bags continue to be successful, also for the most sensitive cells. Wave based single-use bioreactor technology is a well established and proven, yet cost effective method to establish a fully single-use seed train. Different process modes can be flexibly applied to increase cell numbers for subsequent inoculation of larger scale bioreactors. Especially perfusion cultivations appear to be capable of even replacing an n-x stirred tank seed reactor. Sartorius technologies are ideally suited for the production of viral vaccines, vectors and gene therapies. They allow end-to-end, single-use processing of viruses from process development through to commercial manufacturing at the 2000 L-scale in stirred tank reactors. Rocking motion bioreactors are frequently applied in seed cultivation steps, but also as production bioreactors as the technology is comparably cheap and easy to use. Sartorius Stedim Biotech provides single-use technologies and associated services to address the process development and productions needs of vaccine manufacturers. The BIOSTAT® RM is used in seed train in many commercial manufacturing sites worldwide. Bags are cost efficient and easy to handle. Tube diameters of the Flexsafe® RM bags are designed to fit the larger Flexsafe STR® stirred bioreactor bags and Flexsafe media storage bags. Benefit from the same film in you manufacturing platform and minimize the validation efforts. Fully configurable control tower BIOSTAT® B for various application needs. Integrated BioPAT® ViaMass sensor for online biomass determination and reduced sampling need. BioPAT® MFCS - multi fermenter control system for bioprocess data management and automation. 12” touch screen with flush housing integration for liquid protection. Flexsafe RM bags with integrated SU sensors (pH, DO, BioPAT® ViaMass) for full process control. Load Cells to enable more demanding processed, e.g. perfusion cultivation. BIOSTAT® RM 20 | 50 basic is a perfectly sized, single-use, wave-mixed benchtop bioreactor for stand-alone use. 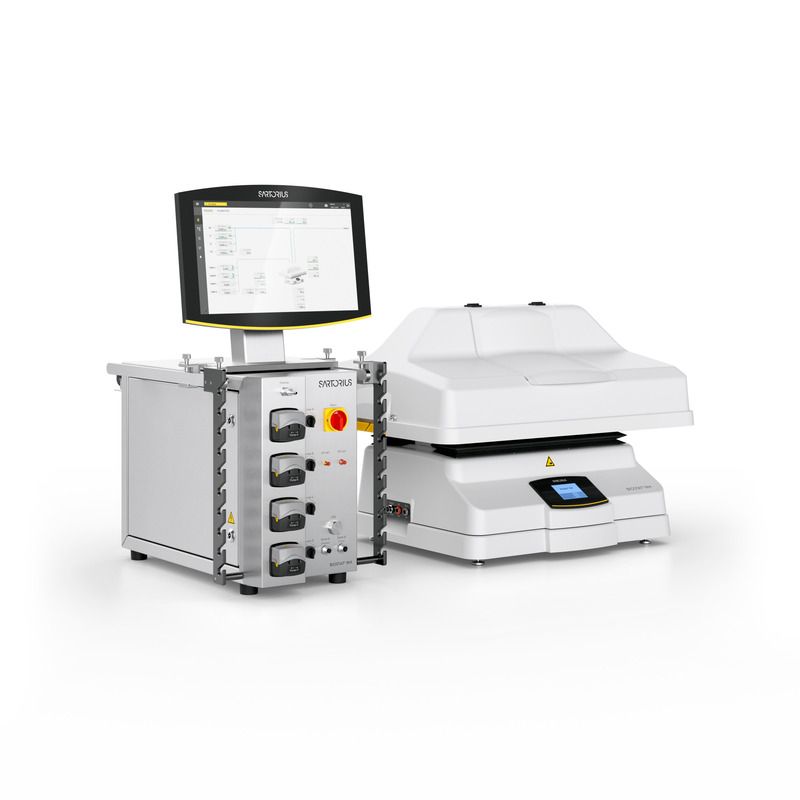 It features an exchangeable bag holder to fit bags with a total volume of 1 – 50 L. The BIOSTAT® RM Basic rocking platform with an integrated local controller, Air | CO2 mixing module and optional load cells is the optimal choice for straight-forward applications, such as seed generation. The BIOSTAT® B is our universal benchtop controller for stirred and rocking motion systems. It is available with the RM Rocker for advanced process control featuring pH, DO and BioPAT® ViaMass. The system is fully configurable and can therefore serve various process needs, from process development to small scale commercial production. BIOSTAT® B with RM 200 Rocker is your choice for production-scale seed expansion and rapid material supply for preclinical and clinical studies using proven rocking motion technology. The bag holder fits the Flexsafe® RM bags in a working volume range from 10 up to 100 L.
The wave generated in the RM bags due to the rocking motion ensures effective gas exchange through the gas-liquid interface. Four different gas lines for air, O2, N2 and CO2 are equipped with flow meters and four high-precision mass flow controllers. An integrated pressure sensor continuously measures the pressure inside the bag. To ensure process safety, aeration is switched off when an upper threshold is reached. The Flexsafe® RM bags are available in 1 L, 2 L, 10 L, 20 L, 50 L, 100 L and 200 L size. Bags are available in basic, optical and in two different perfusion configurations. Basic bags are designed for use in seed train and production applications without pH and DO control. Optical bags feature integrated single-use opto-chemical pH and DO sensors, which are already pre-calibrated. Used together with the BIOSTAT® RM control tower, they allow high end cultivation with full process automation. Basic and optical bags up to 50 L size are also available with screw caps (38 mm diameter). The screw cap can be used for the insertion | removal of larger objects inside a laminar flow cabinet, e.g. microcarriers. Perfusion bags are available in two versions: A) With an integrated 1.2 μm perfusion membrane (PES). The membrane is fixed at the bottom of the bag, forming a compartment for removal of cell free media. The wave created by the agitation moves over the surface of the membrane, thereby flushing the membrane with every rocking motion. This innovative and patented design ensures low fouling and long cultivation times. B) ATF perfusion bags are designed for the convenient connection to an external cell retention device via OPTA connector. Flexsafe® RM Bags are supplied gamma irradiated and ready to use. The Flexsafe® RM bag is mounted on the bag holder of the rocker easily and secured on both sides through fixation clamps. Precise and reliable single-use sensors for pH and DO come pre-installed and sterilized with the bag. The sensors are pre-calibrated and the calibration data is supplied together with the bag (for pH and DO). 10 to 200 L bags are also available with integrated sensors for measurement of viable biomass (BioPAT® ViaMass). All 2nd generation BIOSTAT® B with RM systems can be equipped with the BioPAT® ViaMass electronics.